Java-Gaming.org > Games Center > Showcase > Let's Bounce! I created this back in April for Ludum Dare 23's warmup weekend. 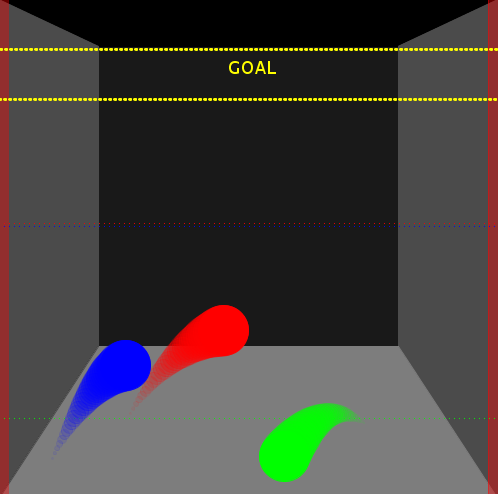 The premise of the game is pretty simple: bounce a ball into the goal, competing against other bouncing balls. Despite its simplicity, I was pretty happy with the results! that works fine, but I didn't reach even the half height required in the first level ! Is there a trick to go higher ? However, I like it because it looks a lot like this ! Wow they do look a lot alike! There isn't a trick, other than to hold down the "down" arrow as you're falling, and hold down the "up" arrow as you're bouncing up. You should always be holding in up or down, and it should always match the direction the ball is going. Switching too soon or too late will slow you down. Oh ok, I forgot to press the down arrow while falling, I try again ! Things get more complex with other balls . BTW, it works fine (physics, IA) and it's pretty fun, well done ! Want to try it, but the applet took forever :/ will try again tomorrow. Hm, I wouldn't expect the applet to take too terribly long, the jar is only 1 MB. I do use a sound library (minim) that I haven't tested on every system, so maybe that's causing an error of some kind? I didn't reach to point where applet console appeared, just loading the page. Hmm, that is strange. It loads for me in ~1 second, even after clearing out my browser and Java caches. Does the Web Start work for you? What system/browser are you running? Will try to load again later. FF 13 Win 7 jdk u29. I would definitely expect that to work. I'll be curious to see how it goes later. Sometimes restarting firefox fixes everything. Thanks guys, appreciate you taking the time to play! Not only play, I took time to look out your site because it seems you want to build playsite for java games. Thanks for checking it out! I won't get too advertise-y here, but I'm in the process of putting a site together that has Java gaming tutorials, as well as a way to upload your own indie games and have a decent-looking website with applet, webstart, and runnable jar versions of your game, without worrying about deployment or web development. It's a work-in progress, but the uploading process does work. I have a few users uploading games, and I just recently added the ability for developers to define an advertisement on their game page so they can hopefully start getting something back! Yeah it's really important to populate it. It's very innovative because we already get tons of flash playsite out there. If you think it's matured enough and ready to publish, make a new thread to promote on General section. Heh, that's actually one of my next steps. There are a few small things I want to get out of the way, mostly cosmetic (improve game thumbnails, for example), and I want to sketch out a rough plan of how Android development fits into the grand scheme. But after that, I was planning on more formally announcing it on these forums. Because I honestly believe a site like this could benefit a lot of people here- so many amazing Java games are hosted on something like dropbox or just a boring gray webpage, which causes potential players to lose interest before they've even played the game. So even if somebody doesn't really care about the other features on the site, having an easy way to create a decent-looking website around the game, I think, would come in handy for a lot of people. In the meantime feel free to check it out. It's completely free and seems to work pretty well, but I'm still very open to suggestions!